Layla Seder …what is it?? 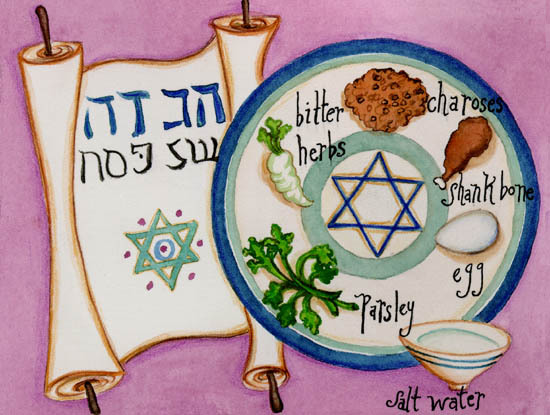 Now then, whilst I am NOT Hebrew, nor of the Jewish faith, I think understanding the customs and traditions of another’s faith is IMPERATIVE to the spiritual wellbeing of us as Brothers and Sisters in God….with that in mind, I present the Jewish Passover…which begins TONIGHT…. The name “Pesach” (PAY-sahch, with a “ch” as in the Scottish “loch”) comes from the Hebrew root Pei-Samekh-Cheit , meaning to pass through, to pass over, to exempt or to spare. It refers to the fact that G-d “passed over” the houses of the Jews when he was slaying the firstborn of Egypt. In English, the holiday is known as Passover. Probably the most significant observance related to Pesach involves avoiding chametz (leaven; sounds like “hum it’s” with that Scottish “ch”) throughout the holiday. This commemorates the fact that the Jews leaving Egypt were in a hurry, and did not have time to let their bread rise. It is also a symbolic way of removing the “puffiness” (arrogance, pride) from our souls. Chametz includes anything made from the five major grains (wheat, rye, barley, oats and spelt) that has not been completely cooked within 18 minutes after first coming into contact with water. Orthodox Jews of Ashkenazic background also avoid rice, corn, peanuts, legumes (beans) and some other foods as if they were chametz. All of these items are commonly used to make bread, or are grown and processed near chametz, thus use of them was prohibited to avoid any confusion or cross-contamination. Such additional items are referred to as “kitniyot.” (usually pronounced as in Yiddish, KIT-nee-yohs). We may not eat chametz during Pesach; we may not even own it or derive benefit from it. We may not even feed it to our pets or cattle. All chametz, including utensils used to cook chametz, must either be disposed of or sold to a non-Jew (they can be repurchased after the holiday). Pets’ diets must be changed for the holiday, or the pets must be sold to a non-Jew (like the food and utensils, the pets can be repurchased after the holiday ends). The process of cleaning the home of all chametz in preparation for Pesach is an enormous task. To do it right, you must prepare for several weeks and spend several days scrubbing everything down, going over the edges of your stove and fridge with a toothpick and a Q-Tip, covering all surfaces that come in contact with food with foil or shelf-liner, etc., etc., etc. After the cleaning is completed, the morning before the seder, a formal search of the house for chametz is undertaken, and any remaining chametz is burned. The grain product we eat during Pesach is called matzah. Matzah is unleavened bread, made simply from flour and water and cooked very quickly. This is the bread that the Jews made for their flight from Egypt. We have come up with many inventive ways to use matzah; it is available in a variety of textures for cooking: matzah flour (finely ground for cakes and cookies), matzah meal (coarsely ground, used as a bread crumb substitute), matzah farfel (little chunks, a noodle or crouton substitute), and full-sized matzah (sheets about 8 inch square, a bread substitute). Some people observe an additional strictness during Pesach known as gebrochts, from a Yiddish word meaning “broken,” although I’m not sure what brokenness has to do with this restriction. Those who observe gebrochts (or more accurately, “no gebrochts”) will avoid any matzah product that has come into contact with liquid after being baked. The rule arises from a concern that matzah may contain bits of flour that were not completely cooked and that would become leavened upon contact with liquid. People who observe this strictness cannot eat many common traditional Pesach dishes, such as matzah ball soup, and cannot even eat charoset on matzah at seder. They are careful not to spill seder wine on their matzah, and promptly remove the wine spilled as part of the seder. Observance of this additional restriction is not common, but many people become exposed to it because it is followed by the Chabad-Lubavitch, who are active in Jewish education. Some have criticized gebrochts for unnecessarily complicating Pesach and taking some of the joy out of this celebration of freedom for no good reason, noting that the premise of this rule contradicts codes of Jewish law that explicitly say it is impossible for matzah to become chametz once it is baked. Nevertheless, this effort to more fully observe G-d’s law is worthy of respect, even if you are not inclined to add this restriction to your own Pesach experience. Pesach lasts for eight days (seven days in Israel). The first two days and last two days of the holiday (first and last in Israel) are days on which no work is permitted. See Extra Day of Holidays for more information. Work is permitted on the intermediate days. These intermediate days on which work is permitted are referred to as Chol Ha-Mo’ed, as are the intermediate days of Sukkot. The Fast of the Firstborn, normally observed on the day before Pesach, is observed on Thursday instead. The search for chametz, normally performed on the night before Pesach, is performed on Thursday night. The seder should be prepared for as much as possible before Shabbat begins, because time should not be taken away from Shabbat to prepare for Pesach. In addition, there are severe complications dealing with the conflict between the requirement of removing chametz no later than mid-morning on Saturday, the prohibition against eating matzah on the day before the seder, and the requirement of eating three meals with bread during Shabbat! The maggid is designed to satisfy the needs of four different types of people: the wise one, who wants to know the technical details; the wicked one, who excludes himself (and learns the penalty for doing so); the simple one, who needs to know the basics; and the one who is unable to ask, who doesn’t even know enough to know what he needs to know. Rabbi Hillel was of the opinion that the maror should be eaten together with matzah and the paschal offering in a sandwich. In his honor, we eat some maror on a piece of matzah, with some charoset (we don’t do animal sacrifice anymore, so there is no paschal offering to eat). The third cup of wine is poured, and birkat ha-mazon (grace after meals) is recited. This is similar to the grace that would be said on any Shabbat. At the end, a blessing is said over the third cup and it is drunk. The fourth cup is poured, including a cup set aside for the prophet Elijah, who is supposed to herald the Messiah, and is supposed to come on Pesach to do this. The door is opened for a while at this point (supposedly for Elijah, but historically because Jews were accused of nonsense like putting the blood of Christian babies in matzah, and we wanted to show our Christian neighbors that we weren’t doing anything unseemly). And the chief priests plotted to kill Lazarus too,because many of the Jews were turning away and believing in Jesus because of him.” -John 12:1-11. This great festival takes its name from the happy tidings brought by the Archangel Gabriel to the Blessed Virgin, announcing the Incarnation of the Son of God. It commemorates the most important embassy that was ever known, an embassy sent by the King of kings, and performed by one of the chief princes of His heavenly court, and directed, not to the great ones of this earth, but to a poor, unknown virgin who, being endowed with angelic purity of soul and body, and perfect humility and submission to God, was greater in His eyes than the mightiest monarch in the world. When the Son of God became man, He could have taken our nature without the cooperation of any creature; but He was pleased to be born of a woman, the One announced in the third chapter of Genesis. In choosing Her whom He raised to this most sublime of all dignities, He was turning to the one maiden who, by the riches of His grace and virtues, was of all others the most holy and the most perfect. The purpose of this embassy of the Archangel was to give a Saviour to the world, a victim of propitiation to the sinner, a model to the just, a son to this Virgin who would remain a virgin, and a new nature to the Son of God — the nature of man, capable of suffering pain and anguish in order to satisfy God’s justice for our transgressions. When the Angel appeared to Mary and addressed Her, the Blessed Virgin was troubled; not at his coming, says Saint Ambrose, for heavenly visions and conversation with the blessed spirits had been familiar to Her, but what alarmed Her, he says, was the Angel’s appearing in human form, in the shape of a young man. What added to her alarm on this occasion was his words of praise. Mary, guarded by her modesty, was in confusion before expressions of this sort, and dreaded even the shadow of deluding flattery. Such high commendations made her cautious, until in silence She had more fully considered the matter: She deliberated in her mind, says Saint Luke, what manner of salutation this could be. 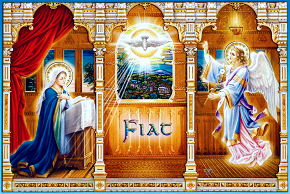 The Angel, to calm her, said: Fear not, Mary, for Thou hast found favor before God. He then informed Her that She was to conceive a Son whose name would be Jesus, who would be great and the Son of the Most High, and possessed of the throne of David, Her illustrious ancestor. Mary, out of a just concern to know how she may comply with the will of God without prejudice to Her vow of virginity, inquired, How shall this be? Nor did She give Her consent until the heavenly messenger informed Her that it was to be a work of the Holy Spirit, who, in making Her fruitful, would not alter in the slightest Her virginal purity. 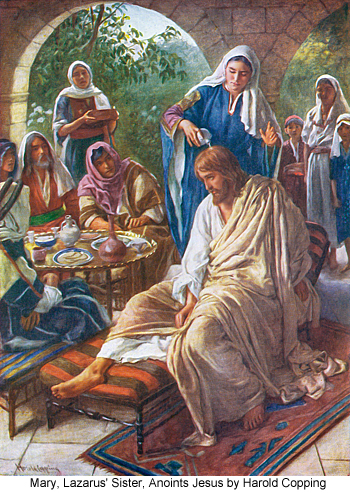 In submission to God’s will, without any further inquiries, She expressed Her assent in these humble but powerful words: Behold the handmaid of the Lord; be it done unto Me according to thy word. What faith and confidence Her answer expressed! What profound humility and perfect obedience!